Most of the old cabinet doors we found on Craig’s List were the sizes we wanted to make a surround for the grill, planter boxes, and bench seats. I also spied a few odd sized doors there and immediately knew they’d make great serving trays so I loaded those up too. I mean, if I’m going to have a nice new patio one day, I’m going to want to serve food out there right? This is an extremely easy project, and is only time consuming because of the wait times for paint and poly to dry. Unless you just like hanging out watching paint dry, you can go back to whatever else you need to do. 1. An old cabinet door, preferably unpainted. 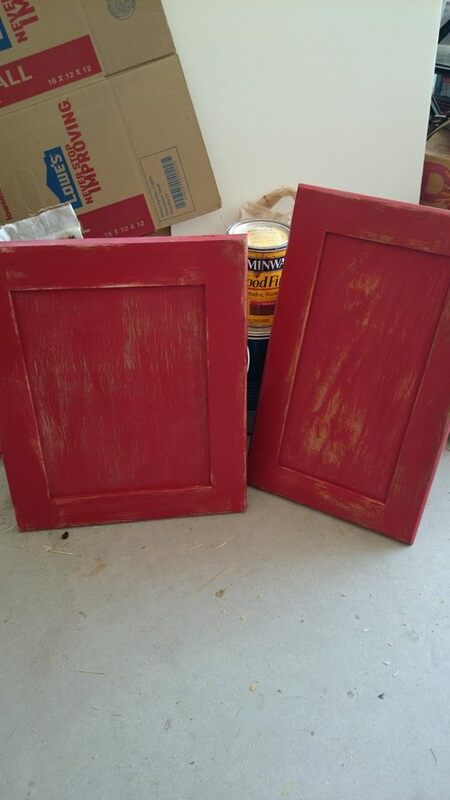 If the door is painted you can either strip it or let the old paint become one of the colors in the finished project. 2. A sample jar of paint in what ever color appeals to you. 3. Stain. I use MinWax Espresso. On used cabinet doors, I find a dark stain makes a more noticeable difference and adds to the “old” look I’m trying to achieve. 4. Medium grade sand paper. 5. High Durability polyurethane. 6. Door pulls. 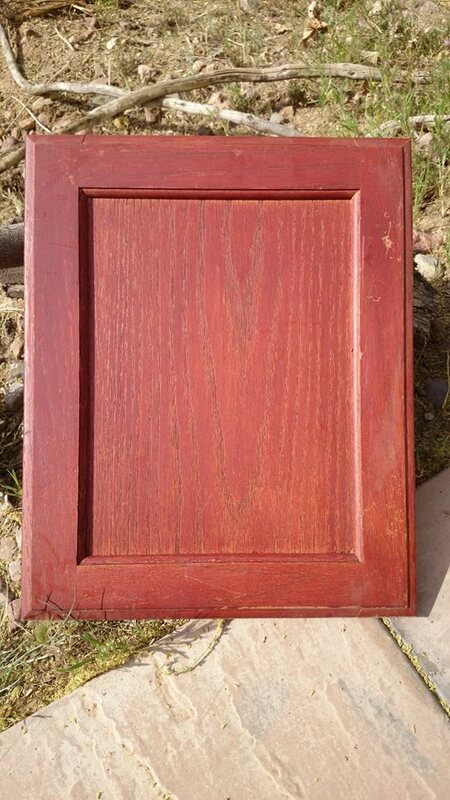 This reclaimed cabinet door had seen some abuse. It started as a golden oak, then apparently someone had applied a polyshade to one side (good grief, they didn’t even do both sides, didn’t that bug them whenever they opened that door?). I had seen someone refurbish an old dresser using red paint and then distressing it. I liked it so I thought I’d use that on my trays. Everyone needs a dash of red somewhere. I picked up a sample jar of red which is enough to do probably 6 of these trays. I didn’t even try to paint a nice even coat. I just slapped it on the door in a medium thickness coat. Once dry, I went over them with a medium grit sand paper to get through the paint, through the polystain, and through the original stain in some areas, and to rough up the paint a bit all round. 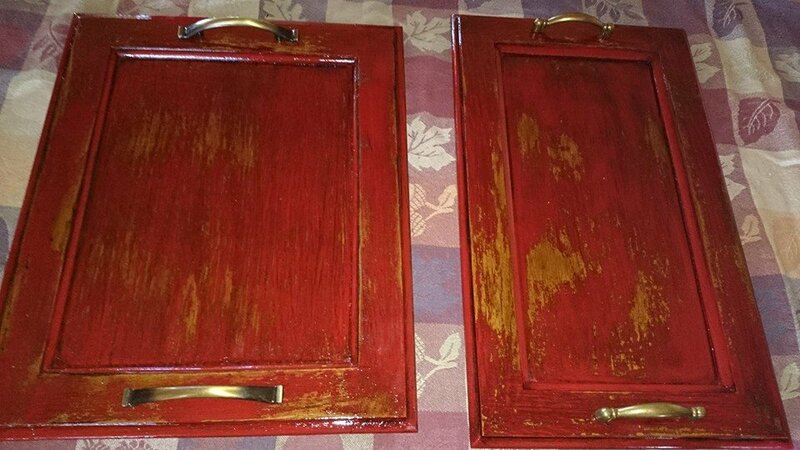 After wiping off the sanding dust I liberally coated both doors with stain and let it set in for 10-15 minutes before thoroughly wiping it off. This will take at least two rags to remove all the excess stain. 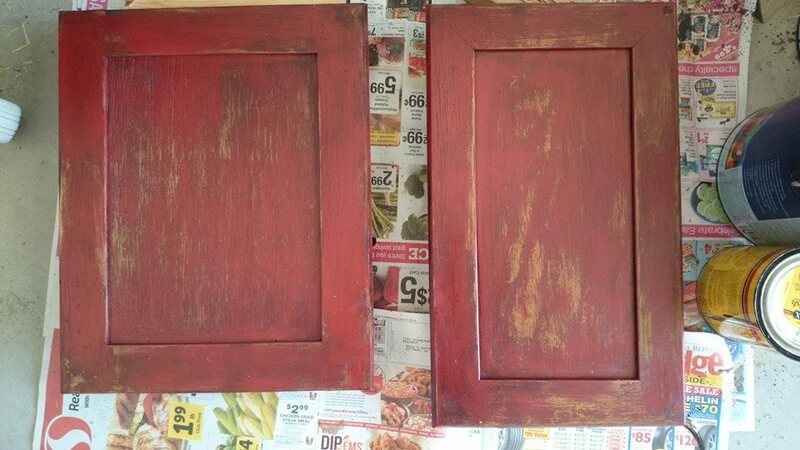 Now you can see the aged look the stain gives to the red and how it darkens the original wood. 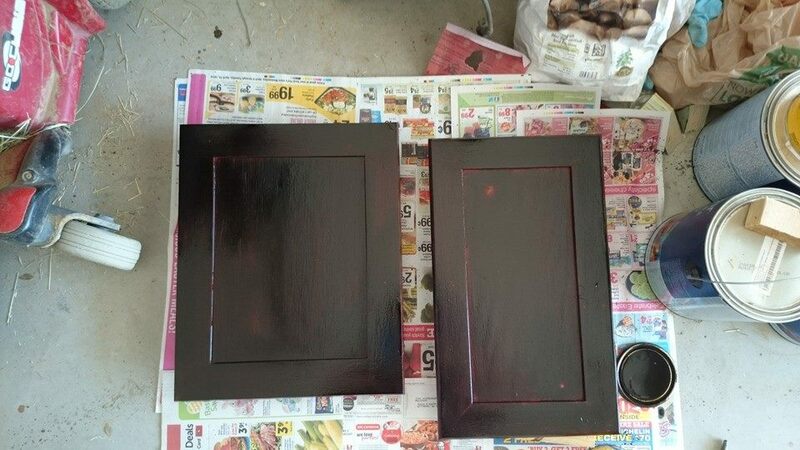 Once the stain has cured and there are no sticky spots or glistening stain on the doors. Apply at least two coats of High Durability polyurethane. You won’t be able to slice cheese on these trays, but you want to be able to wipe salsa off of them easily. If you want to have a tray that you can put food directly on, get an untreated, unstained wood board and apply a non-toxic, food grade oil before adding the handles. The handles I used for these trays are reclaimed cabinet door pulls I found at the Habitat for Humanity ReStore. Once the urethane cures and hardens, it will hold up just fine to the normal abuse from chip and dip bowls, popcorn bowls, coffee cups, cold drinks, etc.and it will wipe clean with a damp rag. No one says you have to use this weathered look and go through these steps. If you like lime green, purple, black, gold leaf, polka dots or whatever your heart desires, just paint your doors the way you love, rough the paint up just a little and urethane it before adding the handles.